We offer database tools and file utilities for Windows. All software are free or trial. We provide excellent support to our clients, including help to choose the best options when solving your specific business tasks when using our tools. Below, there is a brief overview of our best software products. Have you ever used a data export tool? Try our Exportizer Pro and compare. This very cheap and easy to use software can beat many expensive export tools. 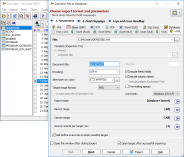 Exportizer Pro migrates data from one database to another, exports data to various file and db formats, saves Blob fields to individual files etc. 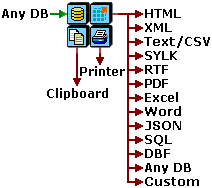 For example, it can convert data from Access to SQLite and vice versa, export Oracle data to accdb and back, PostgreSQL to Interbase, xlsx to dbf, SQLite to CSV, SQL Server to HTML, and allows a lot of other database-to-database or database-to-file export combinations. It is possible to export a table, a list of selected tables, or a SQL query result. You can pick database fields to export or add your own calculated fields. Any export operation can be executed either from GUI or through the command line. Another useful database software is Reportizer, which creates professional database reports. It has a visual report designer, SQL editor, report preview, and can export reports to several output formats like HTML or Excel. And Database Tour Pro combines the functionality of Exportizer Pro and Reportizer and adds many other database specific features. It allows to search in database, view and edit database objects, work with BLOB data etc. Free Icons from File utility extracts icons from .exe, .dll, and other files and exports them to files of wide range of formats. It can also search for icon containing files. Rename Us Pro is a batch file renaming software. Changing file names are done according to renaming rules, which are applied one by one. Renaming rules can be previewed before applying. And if you want to train your mind, you can try our logical games. All are free!